Im pretty new on the scene. I bought a GMC-600 as a gift for my wife as she has always wanted to go to Chernobyl, i am surprising her with a tour there (sssshhh, don't tell her!). I've used it a couple of days now but no matter where i am the CPM never goes higher then 13. and this is only when i place it behind my running laptop. I have tried it around my WIFI modem, the microwave, tv, all the things that i figured would give a noticeable reading. The standard background reading im getting is between 3 and 8 CPM. Isnt this a bit low? Im wondering if there is a sensitivity issue? Is there any way to adjust the sensitivity? How do you guys have your set up? Im starting to think maybe i should have gotten the 600 plus with the better sensor. Indeed, 3 to 8 CPM does seem to be low. But an SBT-11 tube should be plenty good enough to give you a decent readout. I had tested the SBT11A tube and found it to be similar or more sensitive to Background, KCl and Gas mantles than the M4011 tube (used in most other GQ counters) and the SBM20 tube. With KCl and the procedure described in the article you should get something near 150CPM. If that is not reached, then perhaps the voltage setting is wrong. But don't touch this for now! If that also is not helping, then there may be a defect of some kind, but try the KCL test first. GQ doesn't really differentiate between SBT-11 and SBT-11A. The SBT-11A has a thinner mica window and will be the more sensitive tube. If your 600 is an 11 then it will be a little less sensitive, but that is really only for alphas and maybe a bit for beta. I'm in a fluvial valley in front of the Pre-Cambrian Rocky Mountains (ie, lots of granite and metamorphic deposition) I see about 25-30CPM background. I have an 11A in my 600. While the 7317 is more sensitive, I can assure you that the 600 will respond more than adequately when you get into a place where counts can go very high. See my 600 review for some of the counts I've been able to achieve with some handy sources. There is no way to adjust sensitivity. Counts is counts, and in a previous thread GQ has said that it takes a bit for the SBT-11 to settle down. Yours appears to be working. You just need (as ullix has suggested) to get a test source with more activity. The meter does respond well to Potassium Salt. Thanks Guys! I will get some KCI and run some tests. I have just been reading about the difference between SBT-11 and SBT-11A and the general consensus is that the SBT-11 isnt made for picking up Alpha at all! but GQ are selling these units as being able to pick up Alpha? If the difference between the sensor models is true then why dont GQ care which one they use?? with the KCL or smoke detector (still gets 3-8 CPM) then there might be a problem with your device. Maybe tube installation issue. The SBT-11A is a little bit more sensitive, maybe 10%, but I'm not that sure about how sensitive it is. Yes it is able to detect alpha, maybe if you have a broken smoke detector, you can test it with that one also. Yes, my count often goes to 0. I tested the unit on a broken smoke detector (covers of smoke detector removed) and got no response. I have ordered some KCL and will run a few tests when it arrives. I find it odd and a little disapointing that it is just the "luck of the draw" as to whether you get a 11 or 11A given that you pay the same price. I havent checked to see what i have yet because i dont want to void any warranty if my unit turns out to have a problem. The only difference is in the 2nd before last paragraph, and perhaps someone can decipher it? There is no pure alpha emitter. All of them represent one isotope within a decay chain, and this decay chain then has beta and gamma emitters. You will always be able to detect such a substance based on latter emitters even with M4011 tubes. Discriminating between them is an not-so-easy job. You need to make sufficiently long term successive measurements with blocking for alpha and perhaps even beta, without touching the geometry in the slightest. I believe only GeigerLog could handle such experiments; testing for Poisson will be an important part of it! Should you ever succeed in one, please present it! P.S. 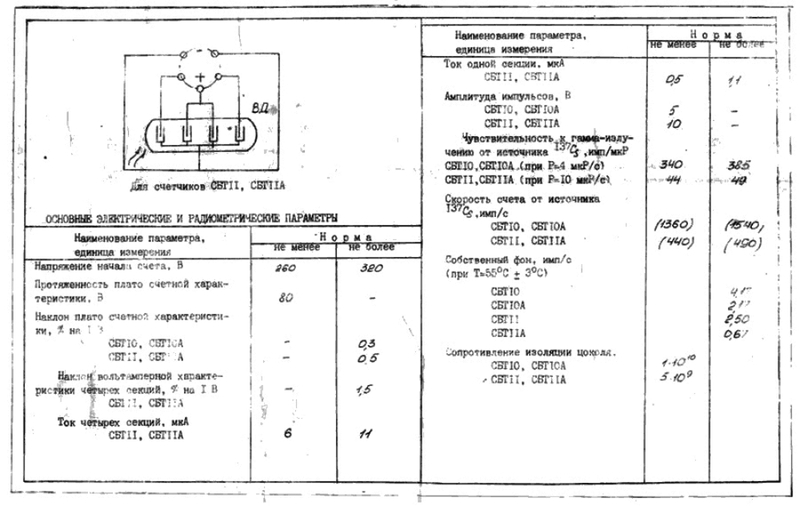 By the way, you see in the diagram that the SBT11(A) consists of 4 tubes connected in parallel. This brings back the idea that a Geiger counter could be constructed to cover a range of sensitivity by using only 1, 2, 3, 4 or even more tubes. This can already be done with with any SBT11(A) or with a set of SBT10 or SBT21 tubes. Any of the many high voltage NPN or MOSFET transistors could act as a switch within the HV lines. And all could work from a single HV source. @ullix, The second to last paragraph talks about random pulses from device itself. Russian says 'Own source pulse' The sensitivity to Cs-137 source is in para above that. It is in CPS and shows 440CPS for 11 and 490CPS for 11A. Above that it specifically talks about sensitivity to gamma radiation and is in CPM, with 11 at 44CPM and 11A at 49CPM. Relative sensitivity to either total field of some amount of CS-137 or for just gamma radiation is that the 11A is 11% more sensitive (or ~10% as EmfDef notes above). Alpha is particle emission and doesn't bounce that I have found. The source in the smoke detector is in a metal cup and it has a metal dome over it that is (normally) plastic clipped and two tabs of the dome soldered to the PCB. When you remove that metal cap by unclipping and desoldering you should be able to see the small yellowish metal chunk of Americium kind of pressed into a tiny cup in the larger metal cup. Try to get to that point and then put the meter over the cup and see if it doesn't respond. That's normally shown to be less than .8-9uCi and quite active for alpha, but you're not going to see it unless the dome is removed. As I understand the process for manufacture, they measure thickness of natural mica sheets and at some threshold it's designated A and thicker than that it's not. So even in A's there will be variation. @Kiwi-Rob, the counter shouldn't have 0 CPM. Does that mean the CPM display is 0? I'll have to check with support if you need to return it for replacement/repair. I think we use the SBT-11 and not the A. Also, WiFi/microwaves/tv shouldn't affect the reading. They emit a different type of radiation (EMF). Edit. If the display CPM often goes 0, you can contact/email support@gqelectronicsllc.com for repair/replacement. Sorry for the inconvenience. Thank you everyone for sharing your knowledge and helping this newbie out! It turns out that smoke detectors with Americium here (in Austria) are banned which explains why i wasn't getting anything from the little black box that lives inside my smoke detector (feeling a little like a idiot!). I hope you get something from the KCL. Let us know about the results thanks! As is to be expected for spec sheets, the narrow columns contain the lower and upper limits for the properties described in the left column. 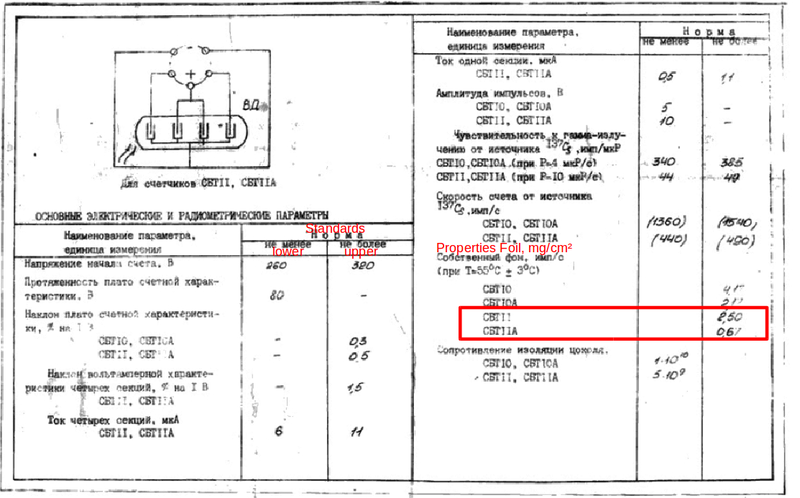 Whenever you see "SBT11, SBT11A" separated by a comma and on the same line, the specs given in the two standards column are the lower and upper limits applicable to both tubes. You see that the two tubes are identical in all aspects but one. This one difference is in the topic literally translated as "Properties Foil". I'd say this is the thickness of the window material (perhaps "Mica" window) given as areal density mg/cm�. For other tubes this is typically around 2 mg/cm�, so a number of 2.5 for a SBT11 makes sense. The number of 0.67mg/cm� for the SBT11A tube means it is VERY thin! For some perspective: when tubes are additionally offered as "military-grade" their thickness is 3...5mg/cm� instead of 2! So, when you got an SBT11 (non-A) tube, consider yourself lucky, as you didn't get such a fragile tube as the SBT11A! The GQ decision to put SBT11 tubes, and not the A-version, into their consumer products is a very reasonable one! I question whether there is even a need to offer a windowed tube. It does allow for marketing claims (perhaps a good enough reason for a company trying to sell products) but I still have not seen anyone demonstrating a measurement of an alpha signal, or a very-low-energy beta signal. Anyone able to show it? @ullix, I responded with correct translations of a number of sections in #7 above. Your 2nd to last paragraph is tube generated noise pulses in cps, and not mica window thickness. So, Thanks for all of the input guys. My KCL arrived. The maximum reading i am getting is 48 CPM. That is with the unit directly on the bag! GQ got 110 CPM from potassium salt (from their site), but they were using a substitute salt shaker and not a bag I believe (larger amount spread across the tube window). My 600 11A got 206CPM from the 1 lb. bag. So your GM tube is about 1/4 of what I think it should measure, as whether 11 or 11A, response to the potassium salts should be very similar. Certainly variability in these tubes, but that seems like a lot. I presume you left the meter on the salt for a period of a few minutes to stabilize. Did you upgrade your firmware to 2.1? Yes, I left the meter on the salt for about 30 minutes. I emailed support about the firmware update but was told that there is no update from 2.0 yet. It is still being tested and i will get a copy when it is released. I have now emailed support again to request repair or replacement of this unit. Support will get back to you soon. I think that your unit needs to get fixed and will have latest firmware when you get it back. @Kiwi-Rob: from what you say I can only conclude that your counter is working as it is supposed to. I don't see an indication for a defect! As your description does not say that you had removed the back-plate of the counter, I assume you have not. In that case you are blocking most of the betas, and a count of 48 is even more than my result of CPM=37.16 with a similar setting. Though given this is a Poisson distribution with a StdDev = Squareroot(N), the two are not necessarily different. 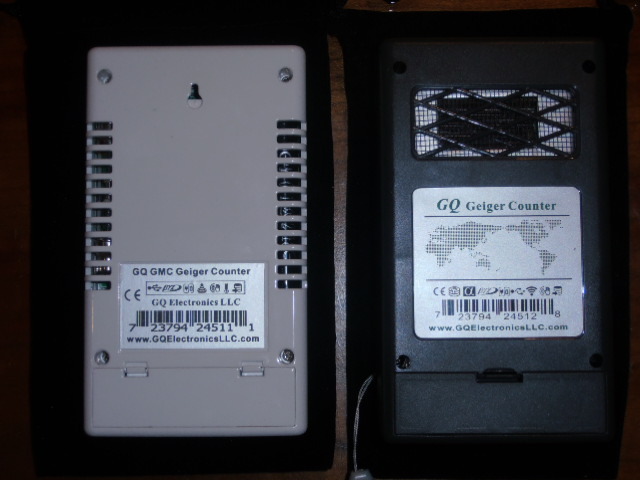 Read the Experimental chapters in the Potty Training (https://sourceforge.net/projects/geigerlog/files/GeigerLog-Potty%20Training%20for%20Your%20Geiger%20Counter-v1.0.pdf/download ) again, and repeat the measurements with the backplate removed! For best performance: Divide your KCl into two plastic bags with at least a pound in each, position the counter on top of the 1st bag, with the tube in close contact to the bag. Put the second bag on top of it; wrap it around the edges a little bit. The goal is to have a similar amount of KCl all around the counter, e.g. with a thickness of ~2cm. Then you should get near 150CPM. Thanks for your feedback! After talking with GQ Support (John) We came to the conclusion that i should send the unit back for a refund and order a new one. The new unit arrived and it works brilliantly! A lot more sensitive and can easily get a reading of 150CPM from my bag of KCI. You are correct in thinking that i didnt remove the cover form the first unit, i didnt want to void any guarantee on it. The new unit easily gets readings without removing any covers or "wrapping" the unit in KCI. Now i am just waiting for my refund for the first unit.... Im hoping GQ are as helpful with their refunds as they are with tech support! Nice to hear that this is now meeting your expectations. I hope you post some screen shots from your visit to Chernobyl. Oh, I missed the fact that the 600 has some sort of a window built-in; thus removing the backplate is not as relevant as in the M4011 based counters. A higher count rate in this new device compared to your previous is a miracle. Unless the voltage setting was way too low? @ullix, the 600 is a mica windowed alpha tube like the 7317. There is a grated cutout on the bottom of the case for both the 7317 and the SNT-11/11A. Judicious use of a different GQ label to cover the opening not needed leaves the other open for tube to receive alphas. I still like the idea of a clip on steel beta shield that covers the bottom of the meter and both opening positions. @ullix, the 600 is a mica windowed alpha tube like the 7317. There is a grated cutout on the bottom of the case for both the 7317 and the SBT-11/11A. Judicious use of a different GQ label to cover the opening not needed leaves the other open for tube to receive alphas. I still like the idea of a clip on steel beta shield that covers the bottom of the meter and both opening positions. According to support, they are still following up on the return. I think this is installation issue, maybe the +/- terminals of the tube are reversed. A little hint regarding difference between SBT-11 without A, and SBT-11A: Both tubes are absolutely same alpha capable tubes with the same sensitivity (in fact my tests show that SBT11 might even be a little bit more sensitive than SBT-11A depending on batch and condition). The difference is that at 55C (131F) and higher temperatures the inherent background of the SBT-11 2.5 pulses/s while for SBT-11A it is 0.67 pulses/s. Inherent background means how many false pulses (which are not the result of the particle detection) the tube generates - yes Geiger-Muller tubes most evidently pancake ones have such a little "sin" - but who hasn't. At room temperatures 25C (77F) the inherent background of tubes is the same (0.25 pulses/second).